Teuton rider: Just like his brother the teuton archer, but has some blank spaces where gold armor goes, you're going to refill it by yourself. Osiris Chariot: Egyptian-like chariot, awesome horses. Trade Cart: A trade cart. CHERO1, 2, 3 and 4: Carthaginian heroes from the game. Carthaginian Maceman: I don't think this unit is very nice... but well. Anubis warrior: Nice and epic unit. Carthaginian Noble: As big as the viking lord, this infantry unit looks very nice while playing imperium. Bronze Sperman: Good looking spearman, with a shield too. British Heroes 1,2 3 and red,blue and deer horns: A variety of old britain heroes who fight bravely against Rome. High lander: Two sworded - redhead fighter. Egytpian Swordsman: A very arabic looking swordsman. Gaul Archer: A not so good looking archer. 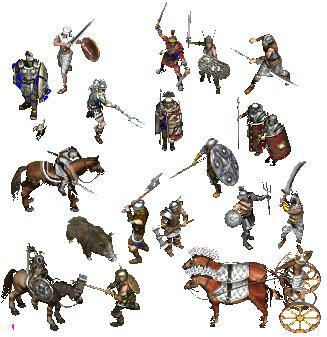 Gaul Male Heroes: Those guys are nice units too. Gaul Female Hero: The only leader girl in the game, a fair unit i guess. Gaul Woman Warrior: another epic unit, AOE lacks of girls so she may be a good addition. Gaul Trident Warrior: The replacement of the Viking Lord for the gauls after the 2nd game, this is a great unit too. Gaul Swordsman: A barbaric looking swordsman. Iberian Catapult: I'm not sure why this isn't in structures as the other siege weapons. This makes my work easier. Iberian Militiaman: The standard swordsman, a fair looking unit. Iberian female and male peasants: Just average ol' peasants. Iberian Heroes: Heroes who fought bravely against Rome. Iberian Enchantress: Retro-Old fashioned Astarté cultist females, may replace the monk. Iberian Cavalry: He reminds me the AOE Huskarl, but he's on horseback. Fairly good looking too. Carthaginian Jav Thrower: Ajá, another jav thrower. Eagle: Rivalizes with AOE eagle. Larax: Star character from Celtic Kings, a fairly good looking cavalry. Lioness: The male lion couldn't be extracted. An average looking predator. NHERO1: He's no other than Mildred (or Milred) the enemy of Larax. Good looking cavalry unit. Oldmen: Old gramps from Africa and Europe, respectively. Roman Archer: The old Rome is here! Plated armor archer, average looking one. Roman Gladiator: Epic warrior forever :D Forza,forza!! Roman female and male peasants: mmm, peasants? Roman Tribune: Wants to betray the Praetorian, yup another two sworded crazy warrior. Roman Scout: This unit doesn't look so outdated as their mates, he may fit well with AOE. Teuton Ram (TTARAN): Some frames of the teuton ram, the others couldn't be extracted. Teuton Axeman: He wishes to be as epic as Gaul Axeman. Teuton Huntress: Blonde girl full of javelins to throw away! Teuton Swordsman: Teuton frontline, average looking one. Trade cart: Carried by a donkey. Trade mule: Gaul bearded man carrying goods in his mule. Well, i hope some one makes nice units for AOE with this utilities. These are the best units in my humble opinion. I'm including a screenie too. DonPisky, I've updated this utility to include all the four packs you have uploaded. There was no reason for them to be released separately, as my colleague has previously pointed out to you in an email. Please feel free to update the file description in order to better describe this upload, add a screenshot, etc. Nice units! I'm trying to make some slps right now. There is a big variety to choose; I like the animals specially. This is like Christmas only I got everything I wanted on my list. Some of these are pretty cool, some of the coolest ones are missing pixels so they will look bad unless each one is individually doctored. Certainly a starting point. The Egyptian hero looks usable so that at least is a nice unit for my scenario. Could sum1 tell me how to use this? can someone please explain how i can use this??? ?